Police are investigating an incident in the downtown core on Tuesday night that resulted in a man clinging to a moving car. The altercation, which was caught on video and sent to CTV News Toronto, occurred in the area of Dundas Street East and Sherbourne Street shortly before 10 p.m. The video shows one man walking away from a blue vehicle and running toward a white car stopped in the area. 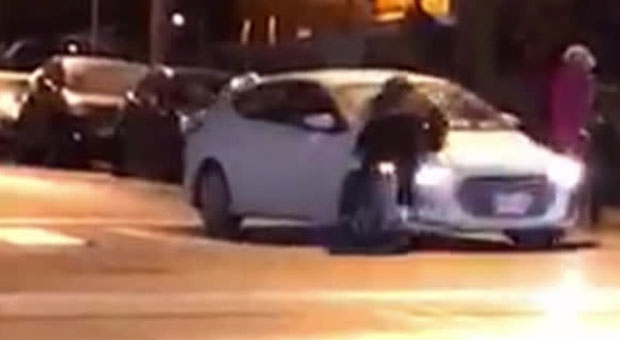 As the white car begins to move, the man jumps on to the hood and clings to the vehicle as it speeds away. The man falls off the car into a live lane of traffic seconds later. Police told CTV Toronto Tuesday that the man suffered only a minor leg injury. Officers are investigating the circumstances surrounding the incident and are also searching for the driver of the white vehicle. Police are investigating a shocking incident of road rage in the downtown core.